Last week was very depressing for me. So I decided to pamper myself by doing my almost favorite thing, which is to have my nails done and a foot spa. I've been meaning to check out nail salons that are near to where I live. There were a few choices but I decided to check out Nail Studio and Day Spa at 105-B Scout Castor St. Quezon City, Philippines, 1103. Their street is adjacent to Tomas Morato St. I used to check out reviews first before going to a nail salon. Probably because of my depressing mood last week, I didn't check any write up pertaining to Nail Studio and Day Spa. I was fixing my desk when I saw their pamphlet and figured it would be my next nail salon review. The colors of this nail salon are rather different from most nail salons that prefer more feminine colors. Nail Studio and Day Spa however, have earth tone colors. According to a few reads after my experience, the motif is to attract and make male clients more comfortable within the studio. Among the various services that they offer, I chose the Love My Nails that included a regular manicure, foot spa, and pedicure. I chose the lavender scrub. 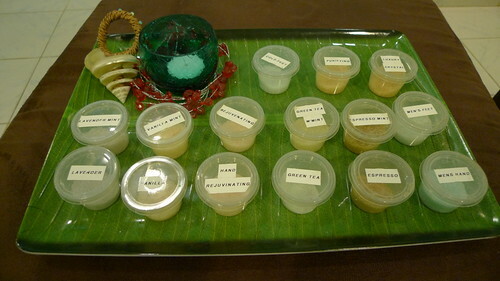 You'll be asked to choose among several scrub variants before your spa treatment. One of the first things I checked when I entered the studio is the nail polishes available. I know, right? My love for nail polish makes it hard for me not to consider available polishes. I was presented with a small basket of OPI polishes and a smaller box with a Orly polishes. Sadly, there weren't that much choices. I thought I should have brought my own nail polish instead. It took me awhile to decide what shade of red I'd wear. I hope they'll add more colors into their stash. 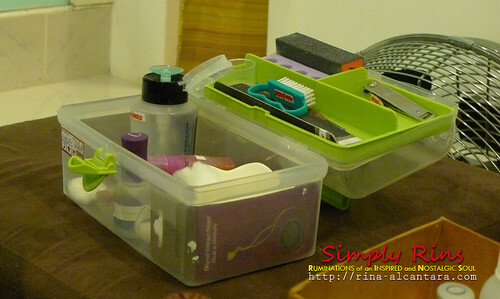 Tool box of nail technicians at Nail Studio and Day Spa. Although the nail salon claims that they disinfect and sanitize their tools, this sight didn't appear tidy to me. Even if tools were cleaned, storing them together with everything else makes the sanitation seem useless. Perhaps if they have a separate container for the tools such as the nail cutter, pusher, and nipper within that tool box, I'd be a happier customer. That would have given me more assurance that they were in fact sterilized. These were used for the foot spa. 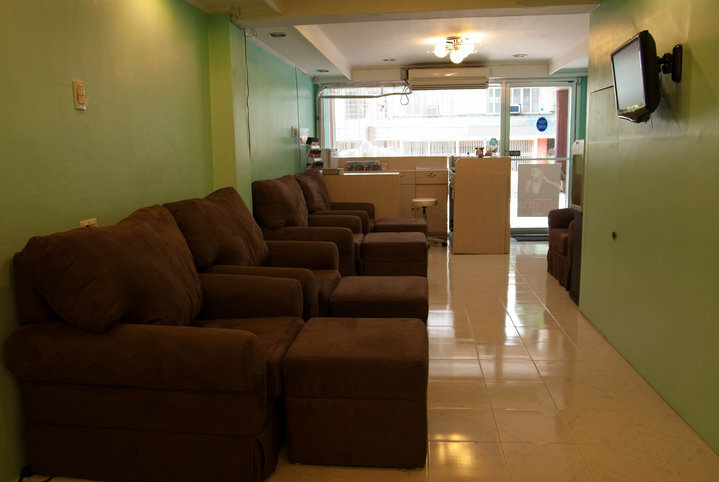 Nail Studio and Day Spa has very comfortable sofas. I noticed though that there were no extra pillows. This made it unfortunate for me because my small frame had a hard time slouching. And since I sat on a loveseat, I only had arm rest for my left arm. And so when the nail technician was doing my right arm, it got really tiring for me because I couldn't rest my arm comfortably. The most disappointing part was how my nail technician handled my manicure. She had heavy hands. I had my vampire diaries inspired polish on when I went to the nail salon and so she had to remove it first. She kept pushing the cotton soaked in nail polish remover towards my cuticle area. A downward motion, moving from the top of the nail to the tips is the proper way of removing polish from your nails. If rubbing comes natural, do gentle circular motions. Worse, she had to push harder and harder because she seems to refuse changing cottons. By this time, I wanted to ask for a different nail technician. But I didn't want to appear rude so I just told her to take it easy. When my nail technician started working with the pusher and nipper, the experience became worst. This was when I repeatedly told her to take it easy. The hard and heavy pushing was too much for me. As a result, I now still have a cut on my left ring finger. It would have been a consolation if she acknowledged the accident. But she didn't, even if I saw that she noticed it. I was also disappointed that no antibacterial solution was applied on the cut. Yes, these cuts are inevitable sometimes, but I couldn't help but be disappointed because I've asked the nail technician several times to be careful when she was cleaning my nails. After my right hand was cleaned and polished, I asked my nail technician if she could clean the excess polish that stained the sides of my nails. She argued that she'll do it after she's done with my left hand. I insisted that it would be easier to clean to clean excess polish immediately after since it's still slightly wet. She said it's not advisable since she could damage the polish on the nail itself. I felt uneasy as I kept looking at my not so neat right hand. With how she handled my cleaning, I can only imagine how she'd clean a dry polish stains. 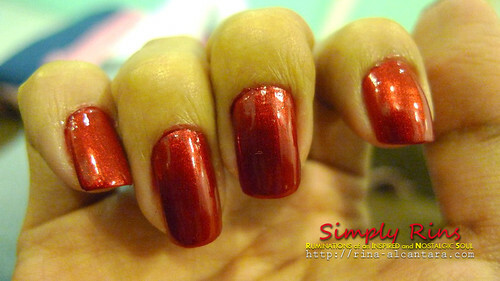 polish in the cuticle area. When I couldn't take how my nails looked, I requested for a repolish and a new nail technician. The same results happened. It was a sad, sad night for me and my nails. Instead of having a relaxing evening, I think I got more stressed out. My foot spa and pedicure experience was okay. The nail technician who handled it was quite friendly and consistently asked me if the pressure for the massage was satisfactory. Apparently, my disappointment with my hand nails got the best of me that night. Magazines were not provided but there's a flat screen where they play movies to entertain clients while being pampered. I'd like to say thank you though, to the lovely owners of Nail Studio and Day Spa for being so receptive with my rants and feedback. Nail Studio and Day Spa also offers nail art and full body massages. 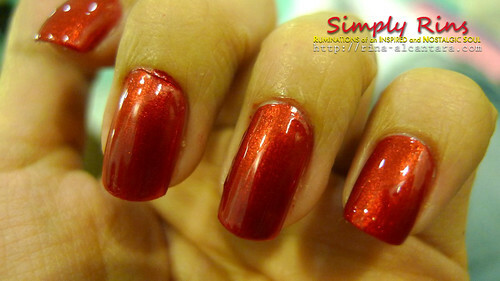 For details on their services, you can visit the Nail Studio and Day Spa Multiply Site or you may call them at 3550910. Disclaimer: My personal experience with Nail Studio and Day Spa may be different from yours. This review is based on my personal insights. hmm, that is really too bad about your experience. I know recently I went and got a pedicure and it was amazing until she went to paint my toe nails and did a horrible job and I don't even know what kind of top coat she used but by the time I got home I had to repaint them, they looked horrible! That's what I did AggiePigeon, the moment I got home, I took my polish off and applied a new one. Please check out House of Glitz Nail Studio. We have a facebook page. Thank you. You have likely already established some basic branding, but effective branding should incorporate your salon style and brand image into every part of the salon.